« A day at the farmer’s market. Well, once we tried gelato, we found ourselves eating it at LEAST once a day if not twice on some days. I loved the little spoons that came along with the gelato. I think my favorite flavor was pistachio. I’m sure between the six of us, we tried just about every flavor offered. Nutella was also something I had not tried before. While in Italy we were served Nutella for breakfast with crusty breads. Since coming back from Italy I have tried it on top of waffles, made a Nutella Cherry Dumpling, filled won ton wrappers with Nutella (fried, and powdered sugar them), filled strawberries with Nutella but I have never been tempted to just eat it out of the jar with a spoon. I was watching Giada at Home the other day and she was making Nutella Gelato and I deceided to make my own version. I added in the crushed raspberries just as the ice cream was almost finished churning. I also changed the whipping cream to Half and Half. If you are wondering what the difference is between gelato and ice cream is, well, it is the proportion of milk to cream. Gelato has a higher percentage of milk vs cream than ice cream does. Gelato machines (I don’t have one) also churns at a slower speed, which doesn’t whip in as much air as an ice cream maker does. Usually ice cream has about 50% air and gelato is 25-30% air. The less air, the denser the flavor of the ice cream. 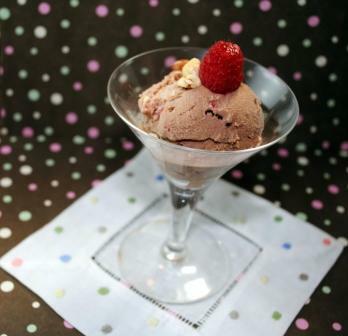 Also gelato is stored at a lower temperature than ice cream which allows it to be softer than it’s frozen counterpart. Whisk the 4 egg yolks with 1/4 c. of the sugar until smooth and thickened (4-5 minutes). Set aside. Strain the custard mixture into a bowl and stir in the Nutella and vanilla until melted. Chill this until very cold before putting into your ice cream maker. Once chilled, pour into ice cream maker and freeze according to your machines instructions. When the gelato is almost frozen, add in the crushed raspberries. 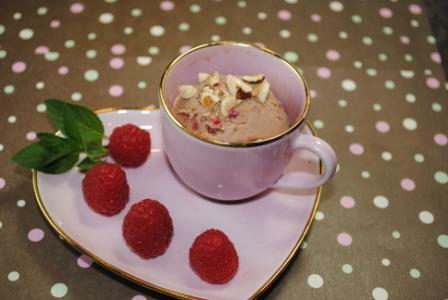 To serve, top with toasted hazelnuts and a few raspberries and mint leaves for garnish. Enjoy! my favorite dessert place in nyc is a gelato shop… especially in the middle of summer. this looks amazing!